From a lore perspective my Corsair warband known as the Lions of Asuryan are led by Corsair Prince I’llyarion, a former Autarch of Craftworld Y’lduin. He was exiled from his Craftworld after after leading his warhost to aid a besieged Exodite world that lay in the path of Abaddon’s 13th Black Crusade against the commands of his Farseers. In an unprecedented move, his entire Warhost and several shrines of Aspect Warriors followed him into exile. 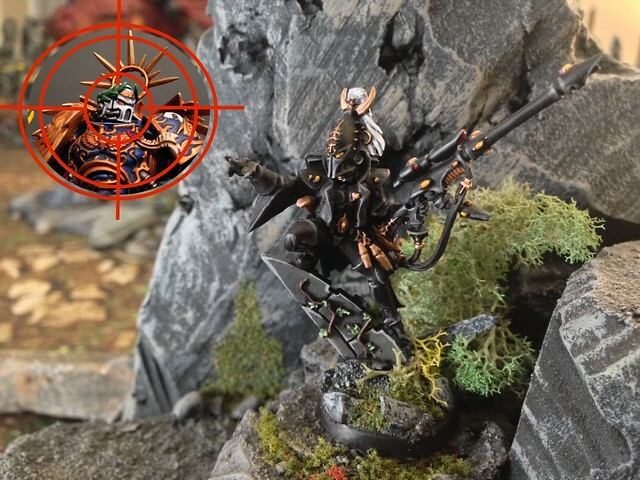 With a large warhost at his command, Prince I’llyarion quickly ascended to the elite upper echelons of Eldar outcasts even carving out a realm for himself in the webway. His warhost would expand greatly as the years went by, fueled by victory and a vision of restoring the ancient Aeldari empire the Lions of Asuryan drew many followers from the Drukhari Kabals, Craftworld outcasts, rival Corsair warhosts and even Harlequin masques. 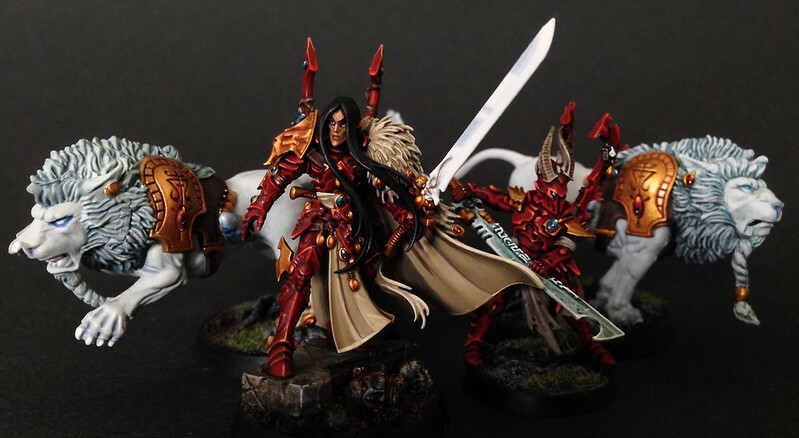 When the Y’nnari rose to prominence, the Lions of Asuryan answered the call of Y’vraine as the shared vision of restoring the ancient Aeldari empire made them natural allies. Ye Old Models from 2010!!! Good use of Dark Elves bits. Corsairs I presume? Striking paint scheme, too. Very unique. Thanks my dark kinsmen! Yeah I pillaged the Corsairs set from WF. I make extensive use of the fantasy line to add variety to my army. Thanks for the praise I appreciate it! I really like your painting. It's very crisp and the selection of colours is great. You don't see those combinations very often but I think it is the right blend of light and dark colours. Can't wait to see more of your work. Thanks alot, I try to go for super-hero color pairing combinations, and try to let the primer do a lot of the work for me. Sometimes my models look a little under-painted but with Eldar things can get really muddy and ruin the look of the model itself. I really appreciate your comments as well as your work on the rumors page. 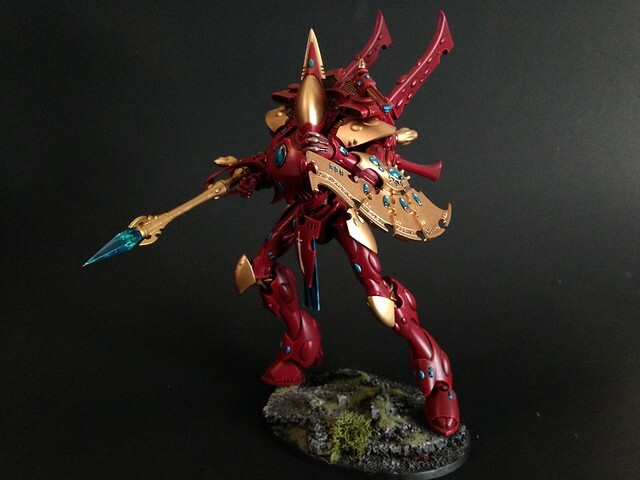 Keep an eye out for Eldar Codex 5.0!!!! As a note to anyone else scoping out my models: My wave serpent fleet is coming up next, as well as my Wraith units, and a pic of my whole army. I'm liking the convsersions! 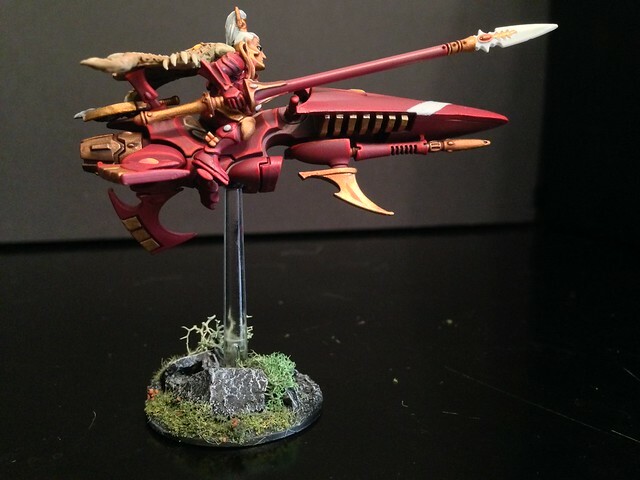 Who knew Dark Elf bitz would look so good on Eldar? I have to say I'm especially a fan of the Exodite outriders and Dire Avengers. Hey guys thanks for all the kind praise! Got some more stuff cooking in the oven. My Eldar Grav Fleet is slowly taking form, and my Wraithwall is slowly being painted as well. Comments and crits always welcomed! Again thanks guys for the nice posts it really spurs me on to keep painting and assembling thanks!!! Time to crack out the bongos. @ Battle Brother: Feel free to idolize, I'm Eldar player so you know I'm at least a little vain But seriously thanks for the nice comments. @ Korrdeth Xyrnndien: Thanks for the comments on my Exodites. My idea for them is that since my renegade Autarch went to their aid, they've begun sending elite conscripts to aid him. The Outriders are just the first conversion, my Dragon Knights will be soon to follow, as well as mini-titans which will be Warwalker/Wraithlord conversion. @DarthPlagis: Thanks for the comments as well. The Dark Elf bits are amazing. I've bought so many kits, and I have bits flowing out of my ears. I highly recommend the entire Elven fantasy line to Eldar players dark or otherwise, but especially if for Dark Eldar players. The hand to hand weapons are just gruesome looking, and they come with tons of skull-laden banners and Cthulu icons. They're absolutely awesome. So thanks again for the comments! 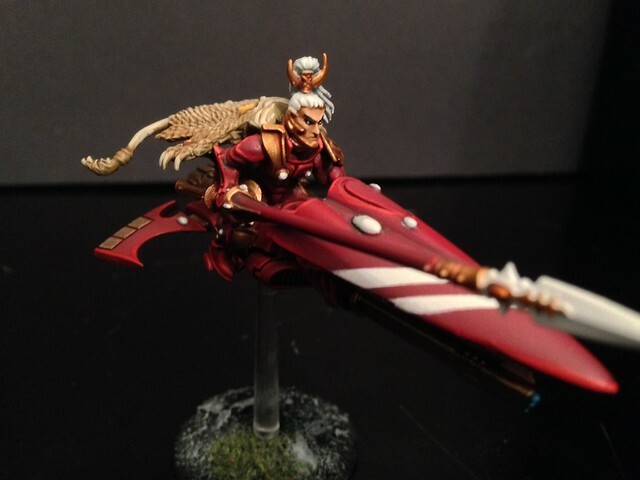 likin the the wraithguard and what did you use for your Farseer??? Hey Battle-Brother. Thanks for the comments on the Wraithguard, they're far from complete and the photo doesn't do much for them either, as the lighting in this cave I presently dwell in makes taking photos really difficult. 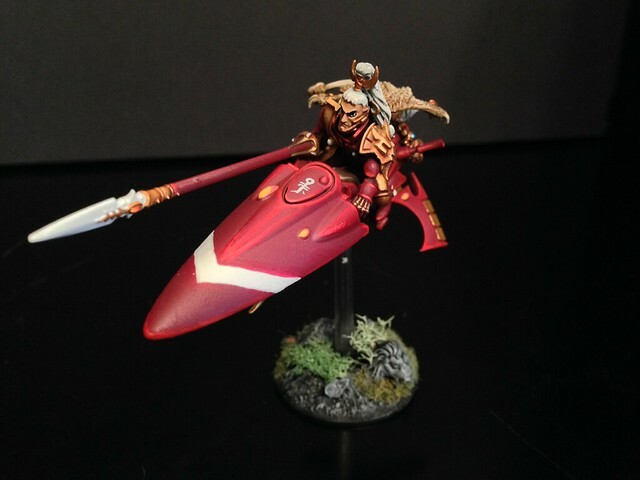 As for the Farseer that is the original Eldar Farseer from Rogue Trader. Its my favorite Farseer model. As far as I'm concerned all the newer ones have paled in comparison to the original. Just dropping in a reply to watch the progress of your army! 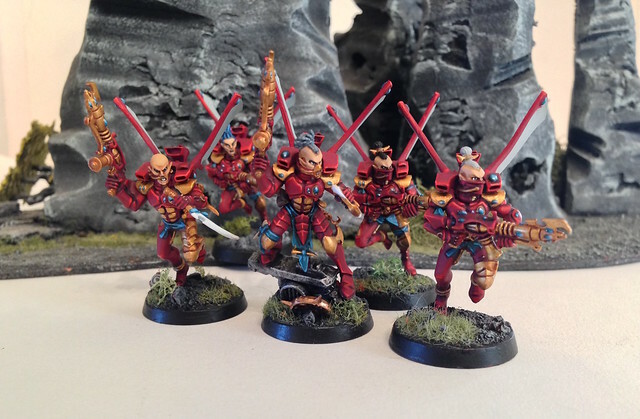 Love the colour schemes for your aspect warriors, bloody brilliant, and very well done. The Fire Dragons are probably my favorite. May have actual comments later when I have time to take in the thread a bit more. Keep it up! Had to reload a bunch of images, so there may be some new ones scattered throughout my posts so check above for something you may not have seen before. @Algavinn- Thanks for your nice comments, especially about my colour scheme. By the way I love your articles, I've read them and re-read them many times. Your one of my faves on the forum. 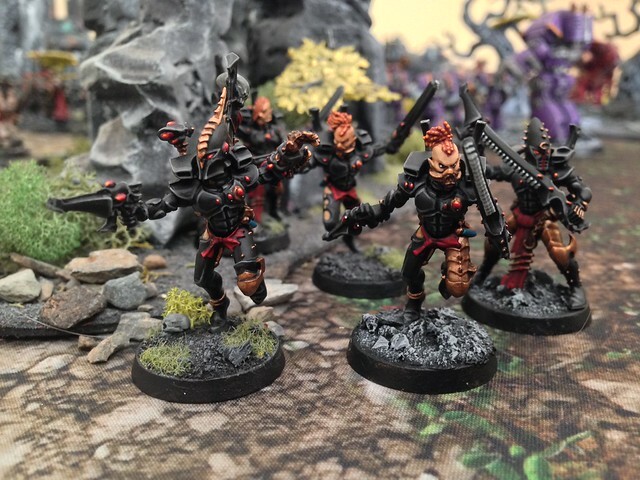 This army looks absolutely fantastic Very nice and clean paintjobs! A few of your highlights look a little thick and stark. For instance the old bug eye'd farseer. The highlights on the red and yellow are very thick. I'd suggest doing an extra layer or two of intermediate color to give them more of a gradient. Is the red on the Prism done? It looks rather flat. Some edge highlights might give it some more depth. http://www.arolkay.com/PaintingWiki - WikiPaint! Come help build a comprehensive modeling and painting Wiki! @ Pherion: Hey man thanks for the comments, but also for the crits. I have a tendency to get real thick on the highlights, and its definitely the lack of a mid-range gradient that holds back the fine details from looking good. Thanks for pin-pointing it because I really wasn't sure myself, so thanks! updates. 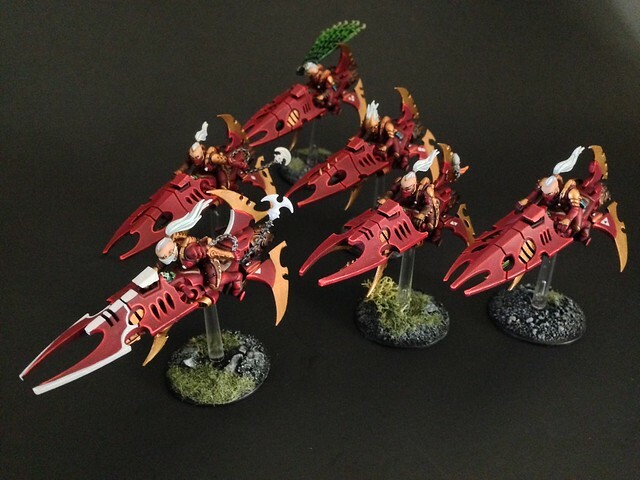 Here is my Shadow Sect Scorpions. The fluff I'm developing for my army is that Karandras sent a unit of Shadow Sect to support my rogue Autarch, which sent shockwaves across the Craftworlds. These are WIPS, but they should be finished this week. I'll make sure to get some good photos when they're finished. More updates soon! Beautiful army, love everything about it, want MOAR!!! @ Tethesis: Thanks for the kind words, and you shall have MOAR! BTW I like your Avatar, old Link rocks! Just a quickie: I've been assembling Vypers, Prisms, and Falcons of which I'll post pics as soon as they're primed (waiting for red primer to arrive at my LGS). Anyway, been plugging away, Scorpions are almost done, and I've begun work on my Outriders.